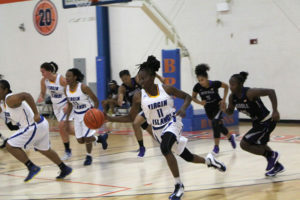 Despite a late start in getting on the court to represent the University of the Virgin Islands where she became the territory’s first female player on the UBI Lady Bucks Basketball team, Joy Victor is making up for lost time. The freshman dropped in consecutive double doubles during the Paul Thigpen Classic in Mount Vernon, Georgia over the weekend in her second and third game in college. The 5 foot 7 inch small forward scored two points and had four rebounds, two steals and a block in 23 minutes against Edward Walters College. “But in my next two game I made up for it, with back to back double doubles,” she noted. Victor who had 34 minutes and 33 seconds of game time against Middle Georgia State, finished with 11 points and 11 rebounds, three steals and a block, in the Lady Bucks, 47-41 loss. In 29 minutes in her second outing, she followed up with 10 points and pulled 16 off the rack against Brewton Parker in a game the Bucks fell, 67-48. 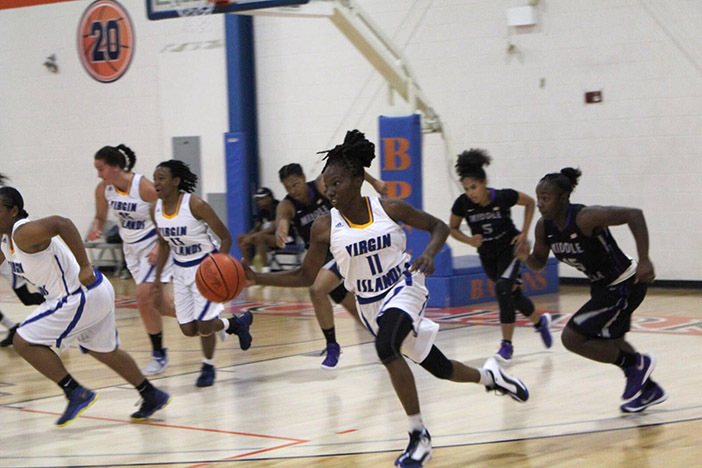 “It’s a great experience playing as a college basketball player,” said the Elmore Stoutt High School Rams graduate, who represented the BVI in the territory’s CBC Championships debut in 2015 at the Multipurpose Sports Complex. Victor feels as she grows in the sport, be more focused in the game and learn the various plays that her teammates have been acquainted with, she’ll be able to pull off a few triple doubles as well. “I just have to lessen my turnovers and keep my rebounds high,” she stated. Currently, the UVI Lady Bucks are 0-5.